Not wishing to belabor the point, but Android and iOS are less than 2 years old as platforms. In that time frame these two johnny-come-latelys have taken 50.2% of the most competitive technology market on the planet. Since the market is not a zero-sum game, I prefer the first chart, but this second view stresses the transition away from incumbent “others” / Windows Mobile toward Android in the licensed OS market. The final chart shows the competition against smartphone non-consumption. 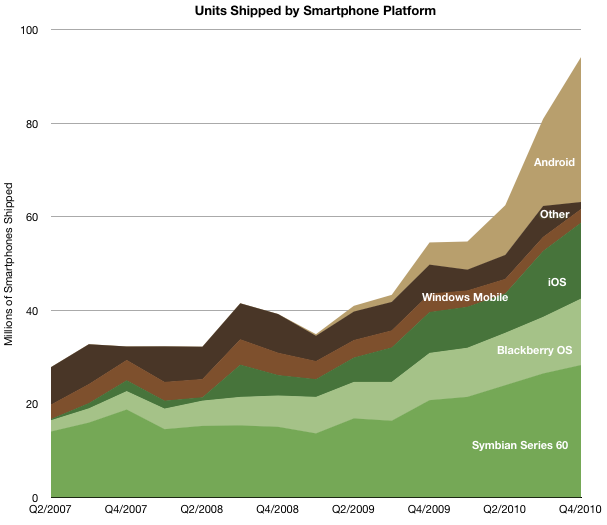 I like this chart best of all as it shows the effect of Android in growing the entire pie for smartphones. What would have happened without Android is anyone’s guess but my bet is that the market would not have grown as quickly. Apple is producing iPhones at capacity and RIM is growing into new markets. 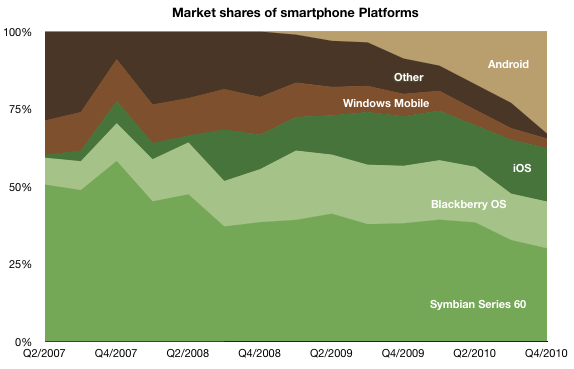 Symbian’s strongest markets also do not overlap (much) with Android. However, the trend seems to be for consolidation of platforms (fragmentation within platforms notwithstanding). This trend, however, is over a very short time span. The smartphone industry started a decade ago and the time frame shown in these charts is a mere 3.5 years. The question remains whether the headroom visible in this chart still allows for new entrants or whether the platforms we see today are the last we’ll ever see in mobile computing. I’m still willing to bet that there is room for innovation and for new platforms. Just like the two newcomers that came to conquer half the market emerged seven years after its inception, new contenders like Windows Phone, Bada, MeeGo, WebOS can still make an impact. The conquerors came with new business models and a focus on computing not telephony. Can factor innovation and the ubiquity of mobile broadband keep this market open to newcomers?